Theresa May will be exposed as a “liar” if the government releases its full legal advice on the Brexit withdrawal deal, DUP MP Sammy Wilson has declared. In a huge challenge to Mrs May’s premiership, her erstwhile allies the DUP are set to join forces with Labour, Liberal Democrats and SNP MPs today in calling for Commons Speaker John Bercow to hold the government in contempt Parliament for its refusal to publish the legal opinion of the attorney general. MPs across Parliament have angrily accused ministers of ignoring the will of the House after they said they would only release a “full reasoned political statement” on the legal position. It follows a binding Commons vote last month requiring the government to lay before Parliament “any legal advice in full” – including that given by the attorney general – relating to the Withdrawal Agreement. Speaking to the News Letter yesterday, DUP Brexit spokesperson Mr Wilson said: “The PM clearly doesn’t want the legal advice published because she knows it makes a liar of her. “She has been going round saying that the backstop would only be a temporary arrangement, but the legal advice she has makes it clear that is not the case. The latest row erupted as it was reported the Attorney General Geoffrey Cox – who is due to make a statement to the Commons today – had warned the UK could be tied to the EU customs union “indefinitely” through the Northern Ireland “backstop”. 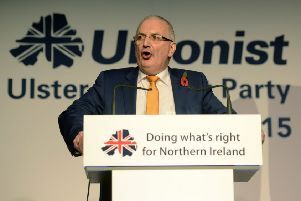 The Sunday Times said in a letter sent last month to Cabinet ministers, he advised the only way out of the backstop – designed to prevent the return of a hard border with the Republic – once it was invoked was to sign a new trade deal, a process which could take years. “The protocol would endure indefinitely,” he is reported to have written. Former Brexit secretary Dominic Raab, who quit last month over the Withdrawal Agreement, said the legal position was clear. “The backstop will last indefinitely until it is superseded by the treaty setting out our future relationship, unless the EU allows us to exit,” he told The Sunday Times. Ministers have argued the legal advice is privileged, in the same way as any advice given by a lawyer to their client, and that government cannot function if it is required to release such confidential material.